Melanie’s “Ring Around the Moon” makes a great little project for MMDers! I just completed the lip-sync motion files for the “Ring Around the Moon” WAV file that is included in the ZIP folder that you can download from our Downloads page. I am calling this a “Project” rather than a “meme” because we are giving you only the WAV file … and the two .vmd lip-sync files for the mouth motions. 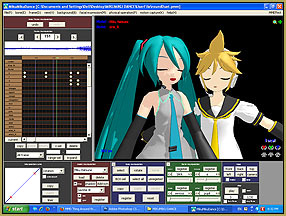 It’ll be up to you to set your stage with your own models… load our WAV file … load the two .vmd files (one for each of the two singers) … and get ready to animate! Create your custom version of our little song and post it to YouTube! 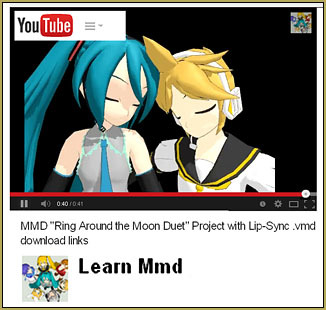 … include MMD “Ring Around the Moon” in the title of your video. Send us a link to your video so that we can write about it on our pages, here, at LearnMMD.com. See the original article about this project for the full credits for Melanie’s “Ring Around the Moon”. 15-Second MMD animation "Smash Walkin' "